I’ve been a huge fan of Erica James from reading her very first book A Breath of Fresh Air (published in 1996). I think I’ve read every book over the years and she is very much an author whose new book I will always buy regardless. 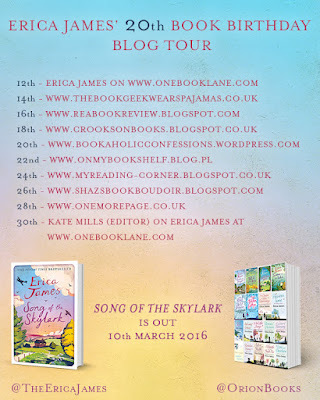 I was delighted to be invited by Elaine Egan of Orion Books to take part in the blog tour to celebrate Erica’s 20th published book – Song of the Skylark. The idea was that bloggers would read two of Erica’s books, the latest one plus one from her back catalogue. 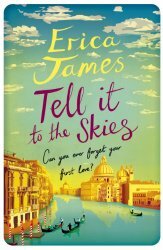 I chose Tell it to the Skies and you can read both my reviews below. I didn’t review books in 2008 but I see from my Goodreads rating that I gave this one 5*. My tastes have changed a little over the years and I was interested to see whether this would still be a 5* read for me. The settings of Venice and Yorkshire worked perfectly for me – I adore Venice and could recognise some of the sights mentioned in the book, I’ve done the touristy things and sat outside at Caffè Florian in Piazza San Marco, with coffee and cake listening to the band. At the back of the book are some interesting details of the role that Venice played in the writing together with a map and some photos. It must be an age thing but although I had read this book before, I couldn’t remember a thing about it and it was though I were reading it for the first time. At just shy of 500 pages, the book will keep you occupied for a while. We first meet the older Lydia in Venice, widowed and with a young stepdaughter Chiara. Following an accident on the Rialto Bridge, she injures her ankle and it is during her confinement at home that the story of her childhood, and indeed, the reason for her injury, unfolds. We then travel to Yorkshire where the majority of the story takes place. Lydia Turner, and her younger sister Valerie, had a very difficult childhood. They were sent to live with their very strict and unforgiving grandparents, who were both members of The Church of the Brothers and Sisters in Christ. For supposedly Christian people, their attitude and and behaviour was anything but and Lydia’s only salvation came in the form of Noah Solomon. Both Noah and Lydia were 9 years old when they became friends at school and they became inseparable. I don’t want to give away anything of the story – there is much sadness and tragedy in their young lives but it is also a coming of age story with a darkness about it. It is obvious from the very beginning of the story that Noah has a part to play in Lydia’s accident and as the story unfolds I was desperate to know what had happened to separate two young people once so much in love. 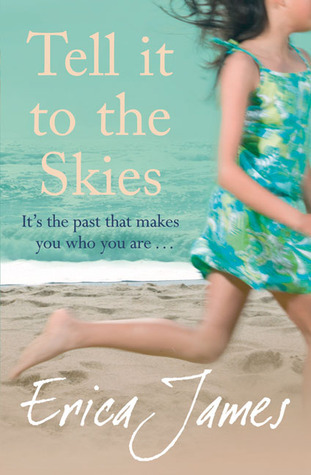 If you want a story that you can immerse yourself in then Tell it to the Skies is certainly worth picking up. The characters are expertly drawn and felt so real I could almost have been there with them and I wanted to weep for Lydia at every cruelty and injustice that she suffered. I’m glad to say this was still a 5* read for me. Now on to Song of the Skylark, the subject of the 20th book celebrations. As with Erica’s last book The Dandelion Years (reviewed here), this is another dual time story combining both the present day and WW2. Lizzie has always had an unfortunate knack of attracting bad luck, but this time she’s hit the jackpot. Losing her heart to her boss leads to her losing her job, and with no money in the bank, Lizzie finds herself forced to move back home with her parents. When she reluctantly takes a voluntary job, she meets Mrs Dallimore, a seemingly ordinary elderly woman with an astonishing past . . .
Now in her nineties, Mrs Dallimore is also reluctantly coming to terms with her situation. Old age is finally catching up with her. As she and Lizzie form the bond of unexpected friendship, Mrs Dallimore tells the story of a young girl who left America before the outbreak of World War Two and, in crossing an ocean, found herself embarking on a new life she couldn’t have imagined. As Lizzie listens to Mrs Dallimore, she begins to realise that she’s not the only person to attract bad luck, and that sometimes life has a way of surprising you . . .
Lizzie has always been a worry to her parents. Unlike her brother, who is far more sensible and settled with his own family, Lizzie has always been a magnet for trouble. When she moves back in with her parents after losing her job at a radio station, her actions have repercussions for her family too. To occupy her time whilst she looks for another job, Lizzie’s mother ‘volunteers’ her for part time work at a local nursing home. This is where Lizzie meets 95 year old Clarissa Dallimore and where their stories begin. Clarissa hasn’t had the luckiest of times either. She first came to England in 1939 as a 19 year old following the death of her parents. She sailed from America and whilst on her journey became friends with three other young people, one a very glamorous and outgoing young movie star, who would all play a very important part in her life. When she first arrives in England she seeks out her grandparents. They were estranged from Clarissa’s parents and Clarissa has never met them. When events conspire to make her remain at their large house in Suffolk, she forges a new life for herself and her story takes us up to and through the Second World War. I was completely captivated by Clarissa’s story and really didn’t want it to come to an end. She had led a fascinating life and had encountered both happiness and tragedy but it was her character that shone through. She was naturally caring but despite her youth she had an inner strength with a strong sense of responsibility and justice and persuaded her grandparents, who could be difficult and set in their ways, to take in others who had found their lives and families torn apart by events in pre-war Germany. Clarissa’s story was occasionally interrupted by Lizzie trying to sort out her life. It wasn’t just Lizzie having to deal with issues, her parents were dealing with the fallout from her broken relationships and her brother was also having his own marital problems. One ray of light in Lizzie’s life was her friendship with Jed, formerly a city banker but due to family circumstances, was now working as a gardener at the nursing home. As the two women get to know each other, Lizzie becomes entranced by Clarissa’s life story and both women find they have gained something special from their friendship. Clarissa needed to recollect and share her memories whilst she could still remember and following their conversations, Lizzie reconsiders her own life and prepares to make some changes. As it got near to the end of the story and I saw how few pages were left, I was a little concerned that the story would all be about Clarissa. Whilst I did prefer the historical side of the story, I was keen to know what decisions Lizzie would make and what the outcome would be to her family’s problems. I needn’t have worried, Lizzie and her family had their own conclusion. 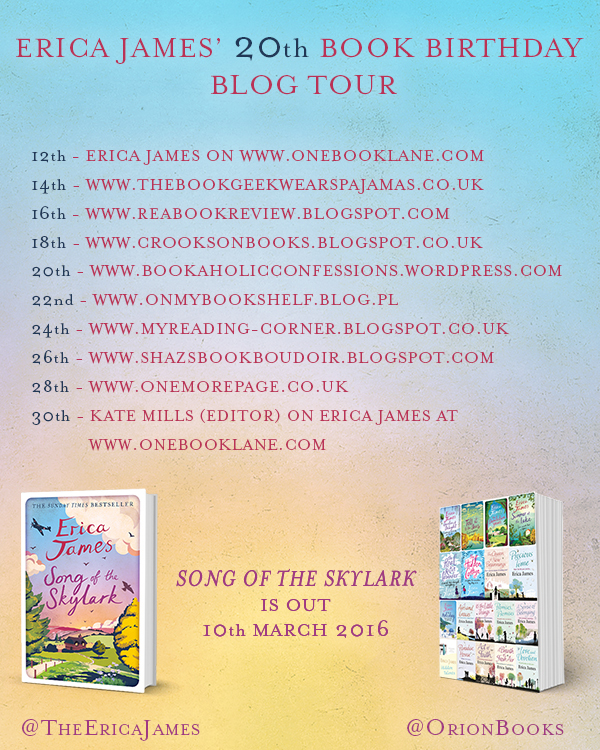 Song of the Skylark is a heart-warming and beautifully written story of friendship, love and loss. All the characters, both past and present are so well drawn and there is a wonderful sense of time and place, especially with Clarissa’s story. I very much enjoyed it and would wholeheartedly recommend it. 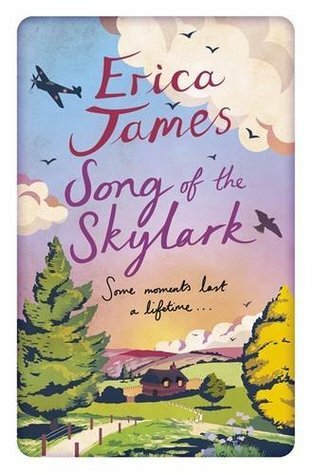 My thanks to Elaine Egan and Orion for the beautiful hardback copy of Song of the Skylark and the paperback of Tell It to the Skies for review.